Do you ever imagine that your internet connection’s speed can boost up to 1000 Mbps? Still tons of homes and offices are using sluggish internet with about 512 Kbps, which not only waste their time but also slowdown the frequency of working. For Bloggers and Webmasters, internet is the workstation if it is lacking in terms of speed then the chances are extremely high that our competitors might leave us behind. Google has a reputation of introducing stunning products thus they are continuing their streak, and has up their sleeves with yet another Powerful service called Google Fiber. 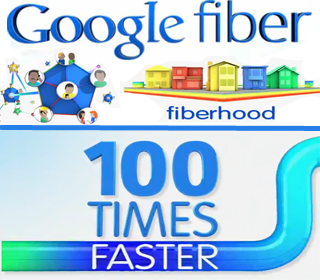 Google Fiber is first Ultra-high speed internet service which says, “It will make your internet connection 100 times faster”. This service is new but still it has created a massive impact on the internet and everyone is going gaga about Google Fiber. So today, we will look into Google Fiber and will discuss how it can boost our internet speed up to 100 times? Google fiber is different, and it will make you different too with its robust features. Fiber takes a round flip to switch, and it is the mutual effort of Google Fiber, your neighborhood and lots of fiber optics. According to the Google Fiber blog “We did a survey that who is interest in working with us astonishingly more than 1,100 cities raised their hands, and those of you don’t know Kansas City, Kansas and Kansas City, Missouri has won the first ever Google Fiber installment because of their enthusiasm”. Google Fiber has finished their first task by installing the first ever Ultra-speed internet connection (1000 Mbps) in the Kansas City, and they are searching for more neighborhoods so they can spread their voice with similar dedication and approach. What do you think Google Fiber would cost thousands of bucks? But if you are thinking like that then I assume you have to change your mind because Google Fiber is Free of cost for a certain extent. However, there are some other plans which have some more features but for extra services Google will charge you. Following are the three existing packages of Google Fiber. Pre-Register Today: To get started with Google Fiber, you have to register yourself on Google Fiber website. This will tell Google fiber team that a person is raising his hand to become a part of the community. Enter your Personal Home Address and you are good to go. After registering yourself on Google Fiber, the work is not completed yet. You have to convince more people in your neighborhood so you complete your fiberhood goal within the time limits, “we always prefer those areas which have the most requests”. Google will not install fiber system of worth millions dollars on your standalone request. You need to engage with your neighbors, tell them about its features and in the end convince them to join Google Fiber. On monthly basis Google will announce who is the winner of fiber installation. If your city has chosen by Google fiber team, then you will receive an email which will lead you to further instructions. 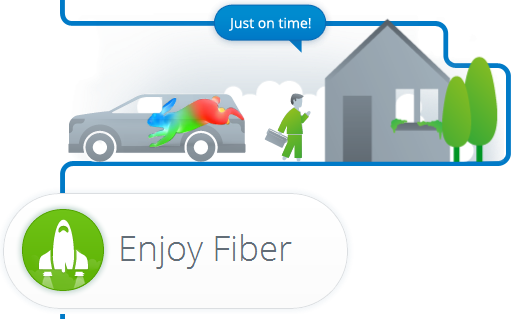 Well it’s your turn to connect to fiber, you’ll get an email asking you to schedule your installation appointment with a Google Fiber team member at a time convenient to you. Then, just sit back, relax and watch us connect you to the speed of fiber. So what do you think will Google Fiber would change the way of internet or another one will bite the dust. All these questions are still to be answered in upcoming days, but so far the results are extremely unpredictable and tons of peoples have shown their interest in Google Fiber. Till then peace, blessings and Happy Google Fiber.